Will Gary Caldwell lose sleep over choosing his attacking players for the Shrewsbury game tomorrow? Question – which club in cash-strapped League 1 can afford to leave a £1 million striker on the bench? The response is that Wigan Athletic can. Moreover they did it last Saturday when Will Grigg was not only on the bench, but was not called on to the field of play as the game at Rochdale progressed. Wigan Athletic’s affluence is clearly the envy of so many clubs in their division. According to Rochdale manager Keith Hill, Latics are the Manchester United of League 1. Indeed the squad that Gary Caldwell has put together is formidable compared those of their rivals. There is a minimum of two players fighting for each position, a healthy state of affairs as far as the manager is concerned. Of course, Latics are in a lower division now, but it could be argued that Caldwell’s squad is superior to that of Malky Mackay in the Championship. The biggest weakness in Mackay’s squad was in the area of strikers. The hapless Scot not only persisted with a centre forward who went on to score one league goal in 34 appearances, but also played winger James McClean as a central striker, where he looked like a fish out of water. In contrast Caldwell has a wealth of striking options available to him. At Rochdale he employed a 4-2-3-1 system, meaning that he had four specialist attackers in his starting lineup. Typically this season he has lined up with three attackers in a 3-4-3 formation, but with wing backs pushed far forward. But even though he played with four attackers he was still able to leave Grigg on the bench, with Jordy Hiwula, Sanmi Odelusi and Haris Vuckic not even making the match day squad. 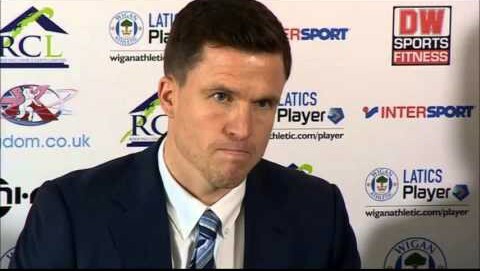 Caldwell has been talking to the media recently about his sleepless nights, as he mulls around in his head the different permutations and combinations available to him. One wonders if his sleep will be any better tonight given the Shrewsbury match coming up tomorrow. It is not only the personnel he chooses for the match to be considered, but also the “shape”. According to Caldwell he had decided on a new formation early in the week because of the way Rochdale attack. Then his headache was to choose the players to lineup in that different “shape”. In previous eras there have been managers who have had a set way of playing, with the players having to fit into the system. There have been other managers who have adapted the style and shape of the team in order to get the best out of the players at their disposal. This was certainly the case for Wigan Athletic in the 2011-12 season. Latics were bottom of the Premier League in November 201l. Following yet another defeat, this time by Wolves, Roberto Martinez switched from a flat back four to having three central defenders and two wing backs. The change in shape was to catalyse a revival in performances, enabling Latics to finish in 15th place, 7 points clear of relegation. The 3-4-3 system had become the norm under Martinez as he used it to get the best out of the players at his disposal. Having played in Martinez’s 3-4-3 and seeing its results Gary Caldwell is clearly a fan. Like Martinez, Caldwell too looks at the strengths and weaknesses of the upcoming opposition. Martinez would sometimes change his team’s shape during a game if things were not working out, although he would typically stand by his 3-4-3 set up. In contrast, already in his brief reign, Caldwell has adopted a variety of tactical formations and is not afraid to radically change his team’s shape within the ninety minutes. What kind of tactical formation will Caldwell employ tomorrow against Shrewsbury? Will he persist with his four attackers in the 4-2-3-1 formation or will he revert to 3-4-3? Will Caldwell consider the strengths and weaknesses of the opposition before figuring out his formation? Part of the reason for Grigg’s benching at Rochdale will surely be down to his late arrival, following his early release from the Northern Ireland squad. Another factor must be the presence of Craig Davies. The 29 year old is a superb centre forward at League 1 level. Were it not for a succession of injuries the big man would surely have played at higher levels throughout his career. Following a hamstring problem he was absent for more than five weeks. He came back on October 20th at Peterborough as a 76th minute substitute. He made a similar late entrance in the next two matches before starting in the FA Cup match at Bury. Davies started in the next two matches against Blackpool and Rochdale, being substituted around the two thirds mark in each. Caldwell is using Davies wisely in the hope that he can have a sustained run in the team without injury. Davies’ ability to turn a defender makes him a nightmare for opposition defences, but he also has pace and no mean levels of skill and tactical awareness. Caldwell will be seeking the right blend among his attackers. Yanic Wildschut’s emergence has provided a whole new dynamic to the forward line and his is one of the first names to go on Caldwell’s team sheet. Michael Jacobs has been one of Caldwell’s leading players this season and will surely challenge for a place tomorrow. But what of the players who did not make the squad last week? Hiwula is not a “target man” type of striker, but he clearly has an eye for goal and will remain in Caldwell’s thinking. Caldwell might not sleep well tonight, as he decides on tomorrow’s lineup. Moreover he will surely also be thinking ahead of the visit of high flying Burton Albion on Tuesday. Will he stick with that same four-pronged attack that did so well at Rochdale or will he bring back Grigg to partner Davies up front? However, many managers in League 1 will not feel even one ounce of sorrow for Caldwell, who currently has an abundance of options at his disposal. His team selection headaches are those which so many other managers in the division would love to have. Looking forward to hearing you on the podcast next week.